Hello! This is a Saturday line battle. If you want to join, please reply to this page with the format listed below under "Event Application Format." If and when you are accepted, you will automatically be assigned line infantry for the following event. If you would like to apply for a specialty, please reply to the forum thread AFTER WEDNESDAY 7 PM EASTERN STANDARD TIME. If you apply for a specialty before this time, you will automatically be denied any specialties the following event. Remember, specialties are first come first serve, no exceptions, so whoever signs up for a special first will get priority for that special the following event. Each speciality must be applied for in a separate post. Make sure once you have signed up to add one of the organisers on Steam! Sign ups are done on the forum, with final confirmation, specialties, and the password being given by TeamSpeak. Be sure to add the event host, Jetch, on Steam and to go to the TeamSpeak server listed above. Team killing is not allowed. Firing out of line allowed inside buildings with 3+. Pistols are considered melee weapons until an all charge, where they can be shot once but not reloaded. Obey all commands given by admins. All specialty unit caps are subject to admin discretion and may be reduced during events. 3 Players minimum allowed. 2 Officers maximum per line. FOC*, FOL, and ROL is not allowed. *If any part of your line in melee (including the Officer) you must stop firing. If less than 3 alive, line infantry must join a friendly unit or charge a nearby enemy. May only use line and guard infantry classes. Dismounted dragoons are acceptable. No spacing allowed when firing or reloading. Crouching is not allowed when firing or reloading. 16 Players, including 2 Officers maximum, allowed; the General unit counts as an Officer and may be replaced. May be reduced during events at admin discretion. If less than 3 mounted, cavalry must join a friendly unit. May remain mounted though may NOT initiate melee. Can join existing melee. A regiment can only take one kind of cavalry, they may not take multiple classes. Dismounted cavalry are considered light infantry. Exception to dragoons who are considered line. - Must keep 3 horse spacing max while firing and may NOT fire or reload in melee. - May fire while moving if within spacing. - Dismounted dragoons are considered line infantry. May crouch while firing or reloading. A regiment must take either all riflemen or all light infantry, not both. If less than 3 alive, skirmishers must join a friendly unit or charge a nearby enemy. - Must keep 3 man spacing max and may NOT fire or reload in melee. - May choose line or light infantry classes, but not foot guards. - Must keep 5 man spacing max and may fire and reload in melee. Only the regiment that has artillery may be affected by this ruleset, this is NOT universal. Maximum of 2 artillery pieces, may be reduced during events at admin discretion. Crews must bring 1 howitzer and 1 cannon. Not 2 of both. Either may be replaced with 2 rockets. Sappers are given 50 build points. Guards may only fire within 15 paces from an active arty piece. Guards not in the vicinity of an active arty piece are considered line. Artillery is considered active when artillery crew are within 5 paces of an unlimbered cannon. Hello! This is a Friday line battle. If you want to join, please reply to this page with the format listed below under "Event Application Format." If and when you are accepted, you will automatically be assigned line infantry for the following event. If you would like to apply for a specialty, please reply to the forum thread AFTER MONDAY 7 PM EASTERN STANDARD TIME. If you apply for a specialty before this time, you will automatically be denied any specialties the following event. Remember, specialties are first come first serve, no exceptions, so whoever signs up for a special first will get priority for that special the following event. Each speciality must be applied for in a separate post. Hello! This is a Tuesday line battle. If you want to join, please reply to this page with the format listed below under "Event Application Format." If and when you are accepted, you will automatically be assigned line infantry for the following event. If you would like to apply for a specialty, please reply to the forum thread AFTER FRIDAY 7 PM EASTERN STANDARD TIME. If you apply for a specialty before this time, you will automatically be denied any specialties the following event. Remember, specialties are first come first serve, no exceptions, so whoever signs up for a special first will get priority for that special the following event. Each speciality must be applied for in a separate post. Wouldn't it be nice if the whole community was like this? Regiments - How do they work? Or if every regiment was like this? The founding concept of Napoleonic Wars is to play in special events (often called "linebattles"), set with special rules to make it more fun and immersive for everyone involved. To get into these events, one must be a part of a regiment, an organized group of players that work together for one leader. There are countless numbers of regiments, and each one is a little different. Finding the right regiment for you is the most important part of enjoying everything the Napoleonic Wars regiment has to offer. It's so important that a whole board has been devoted to regiments for recruiting and discussing subjects among themselves. So start you off, you should visit Althalus' guide to choosing a regiment. From there, you should decide what kind of regiment you are most interested in. Next, it's time to find that regiment! You can either visit the Regiments List thread and look for a specific regiment yourself, or you can take a different route and post an application on a single thread devoted to recruitment: Looking for a regiment or members? Then post here! Different regiments have different requirements, so make sure to post your age and timezone, along with what you want in a regiment. And remember that a regiment doesn't have to be only a way of attending NW events. It can be a whole new community of friends that you can play other games with as well! Mods - What are those? A battle from Whigs and Tories. Regiments Again - I want to make my own! Every officer dreams of looking this fantastic. Best of luck to you! (You're going to need it. ) Being in a regiment is nice and all, but maybe you want to try your hand at leading instead of following? That's fine, but it's going to take quite a bit of work getting there. Making the regiment is the easy part - Getting people to join is what makes or brakes it. If you're going to beat it, time to read up! The first place to start is ash.j's excellent write up: How To: Make a Regiment. Although it kind of covers everything regarding that, it doesn't hurt to mention some of the more important resources that some of our wonderful community members have provided. Most importantly, save yourself and the community a major hassle that many run into when making a regiment: Don't use an already used regiment name! How do you avoid it? The easiest way is to check Regiment List, which keeps a list of every active regiment in the game by having them apply to have their name listed. If a regiment drops out of the game, they'll be removed. Be sure to apply for your regiment as well! After creating your regiment, you are going to need members. Furrnox provides an excellent guide on how to increase recruitment. As mentioned before in how to find a regiment, do the same to find new members by haunting that all-important recruitment thread. Once you have the members, you have to find the events that you want to attend. Again, there are whole subforms devoted to this for both Europe and North America. Be sure to check the stickied threads in those subforums, as they can make finding active events much easier. Otherwise, if you decide you want to try your hand at running an event yourself, check out Deofuta's guide to event hosting to learn the basics. With great power comes great responsibility, so use it wisely, and try to enjoy yourself! Otherwise, what's the point of playing a game? Another aspect of NW events is the 1v1, where two regiments fight each other alone on a server. Such a battle can be done as a fun test of strength, or in a more competitive form called the Napoleonic League. Two such leagues exist, one for Europe and another for North America, both of which can be found in the stickied threads in their respective subforums. Leagues matches are handled much like other sports matches, with each victory and loss counting as points in those leagues. At the end of a season, the playoffs are held and a champion crowned. 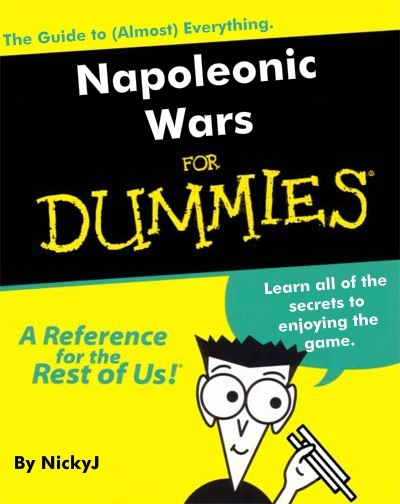 When asking people about what they think of Napoleonic Wars and its community, your mileage may very. Some will say it's a fun game with an enjoyable community, others will say that it's a dying game with an annoying community. Neither is particularly wrong. Napoleonic Wars has been played for over three years, and even longer when considering its predecessor, Mount and Musket. So, yes, it is old and many people have come and gone from the community; but that doesn't mean you can't enjoy what it has to offer. So give it a try, and as always, try to have fun. Whether that's by joining a regiment, creating your own, or being one of the lone-wolfs that populate the many public servers of the game is up to you. In any case, this concludes the tutorial. Best of luck to you, and see you on the battlefield! If you're going to make a regiment, you gotta to know where to start and who to know! If you're going to have a regiment, you're going to need some events to join too. And if they don't suit you, make your own! Things (Medals, texts, maps etc) made by people from the community! Some mods that are already in progress and completed by people of the community! Any regiments or coalitions that wish to have their events added must use one of the templates below. People who fail to use it may be asked to repost their application if needed. As with the regiment list thread, I shall update the list as soon as possible. Many thanks to Dainyel, Death by EMP, and SeanBeansShako for maintaining the previous threads. Hosted at 9 PM GMT / 4 PM EST on the first Sunday of every month, beginning April 12th, 2015. In the three years since Napoleonic Wars was first released, thousands of players have come and gone from the community. As that time goes on, more and more veterans of the early days disappear forever. With them go the dreams and aspirations that drove the community to heights never before expected. From the roots of a simple, fun loving mod name Mount&Musket, a wonderful mod blossomed into what we have today. Fewer and fewer people are left from those early days, which have become a legend - A Garden of Eden - to the younger players that never had the chance to experience them, of which I am one. Although those days are gone and are unlikely to return, the people that do still play remember it fondly. This linebattle doesn't seek to replace those times that are gone, but hopes to share some of those experiences to those that never had the chance to see it themselves. With the help of new regiments, and hopefully some old veteran regiments that are still alive and kicking, those hopes can be realized. This event will occur once per month, on the first Sunday of the month. The event will start at 9 PM GMT, last 5 rounds or 1 hour (whichever arrives first), and will include line infantry, cavalry, and artillery. FOR NOW, skirmishers will not be included. Sign ups are done on the forum. Final confirmation and giving out of the password are done over steam, so in order to do that you must add our event admin: [73rd] NickyJ. In order to eliminate miscommunications, regimental leaders must message the event admin on Steam if he needs anything. Ingame chat messages will be ignored when pertaining to bans and kicks. If the rules are broken on a regular basis, you will not be accepted into the event again. Make sure to read the rules before applying! By applying you agree to have read and accept these following rules. May not fire while charging. May not reload while charging. When 3 or less, players must join another line. Must always be in formation unless in charge. Dragoons must dismount and form an infantry line to fire. When 3 or less are alive, players must dismount & join a line on foot. May fire out of line when within 20 paces of an artillery piece. Guards must take an infantry class. Skirmisher classes are not allowed. Thank you to everyone who has run this thread previously. All factions have their own post. This makes it much more efficient and easier to manage, as well as finding a regiment that suits your own need. - Intro - Introduction to the thread. - Application Format - Fill in format what you will need to copy, paste, fill in and post to get your regiment on this list. - Small Explanation of the Application Format - Basic explanation of the things that are included in the format. - Contents of Thread - Explains what is on each post. Polls will be put up on this thread from time to time. Results of Polls will be placed on the main post. Regiment Name - The name of your regiment/clan. Faction - Which faction is your regiment based on? United Kingdom, France, Russia, Austria, Prussia or a different/fictional faction (other). Class - What kind of unit is your regiment. What you play as.You can have more than one. Based- Where is your regiment based? I.E EU/NA. Please include the native language if it is not English. Brigade/Division Name - The name of the brigade/division itself. Involved Regiments (With thread links) - The regiments that make up the brigade/division. Feel free to add more spaces appropriately for the amount of regiments actively in the brigade/division. Please include a link to the regiments thread. Thread Link - The link to the thread for your brigade/division. If two regiments have the same name, the first regiment to apply has the right to refuse the second's application, regardless of timezones. No regiment names may be "reserved" for future use. If it isn't in use, anyone can apply with it. Please do say if your regiment disbands, otherwise the list will be clogged with disbanded regiments. If your regiment changes thread or name, say what the name of your old regiment was. Regiments will not be added to the list without an FSE thread; Taleworlds threads and Steam group links are not accepted. Which Guard Unit do you think is best? Should I add another faction? Should a "Marines" section be added for each faction? Should the Engineers section be removed? What Faction has the best Sapper uniform? Should all locked regiment threads be removed from the list? What links should be acceptable for regiments to provide for them to be added to the list? Should EU/NA be removed, and instead put EU/NA regiments in both EU and NA lists?